Dr.D. Arivuoli obtained PhD from Anna University in 1988. He is the Professor in Crystal Growth Centre, UGC National facility for Crystal Growth, Anna University. He has 29 years of teaching and 36 years of research experience. He is a Fellow and Charted Chemist of Royal Society of Chemistry, UK. He has published more than 148 papers in the internationally reputed journals His field of research is nanomechanics and nanomaterials, epitaxy of semiconductors and crystal growth and characterization, He was nominated as member of many expert committees at state / national level, which includes, member of the Tamilnadu state four member panel for Kudamkulam Nuclear reactor project, 2012 and as member of various UGC expert committees for UPE and CPE. He is a member of many professional bodies at the national/International level. He has completed research projects to a tune of ten crores including a 2.33 crores DOE project on LEDs. So far 26 students have completed PhD under his supervision and his work on nanomechanics is referred to as ‘Arivuoli model ‘in literature. He is a member of the Board of studies in many private/ deemed/ state universities in the field of Nanoscience and technology. He has authored three international books series. 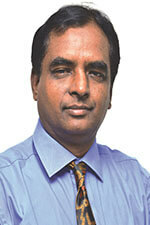 He is the editor/ editorial board member/ reviewer for various high impact factor journals. He has organized 24 state /national/international level workshops on Nanoscience and technology. He was awarded the distinguished researcher award by Anna University, Eminent scientist award by Madurai Kamaraj University, Lifetime achievement award by AMET University and Venus International foundation and prestigious commonwealth Fellowship, Euro4India Researcher fellowship. 1. Written a chapter on “Principles of Verneuil growth” for the encyclopedia on Materials science published in 2001 by the Elsevier publishers, U.K.
137 Sophia, P. Joice; Arivuoli, D.; Attolini, G.; Bosi, M.; Buffagni, E.; Ferrari, C.; Rossi, F.
International Journal of Mechanical and Industrial Engineering (IJMIE), ISSN No. Nanoscience and Nanotechnology, 15(6)2015, pp. 4414-4420. 132 P. Karthika, H.A Esfahani, Y.H Deng, Kevin C.-W. Wu, N. Rajalakshmi, K.S. Asian Journal, pp. 902-907,vol. 8, 2013.
direct ammonium borane fuel cells”, Journal of Nanoscience and Nanotechnology, pp. AIP Conf. Proc., pp. 710-711, Vol. 1512, 2013. Fluorine Doped Zinc Oxide (FZO) Thin Films Deposited by Aerosol Assisted CVD”, J. 126 Radhika Ramadoss, N. Kumar, R. Pandian, S. Dash, T.R. Ravindran, D. Arivuoli, A.K. J. Phys. D: Appl. Phys.425304, 46 2013. 122 P. Karthika, Hamed Ataee-Esfahani, Hongjing Wang,Malar Auxilia Francis, Hideki Abe, N.
Journal of Nanomaterials and Biostructures, Vol.6, pp.1597-1603, No.4, (2011),. Il Nuovo Cimento C, vol. 34 (4/5) 2011. 95 T. Anne Kuriakose, S. Narayana Kalkura, M. Palanichamy, D.Arivuoli, KarstenDierks, G.
J. Crystal Growth, 263 (2004). Journal of Crystal Growth, 263, 495-503 (2004). Surface and coatings Technology 182-183, 293-299 (2004). Science and Technology of Advanced Materials, 4 415-419 (2003). Materials Chemistry and Physics, 76, 187-190 (2002). "Applied Superconductivity" Ed.Factofy, DGM Press, Germany, Vol.2 (1993) 1557. INTERNAL REPORT NO. 65, (1992) MASPEC-CNR, PARMA, ITALY. April 1-4, 1992, Piestany, Bratislava. The variation of lattice parameter of homoepitaxial layers of HVPE grown InP, D.
Applied Surface Science, 119-125 (2001). Mater. Chem. Phys. 66 (2000) 207-212. Growth of BSO and BGO crystals by the Czochralski technique and their characterization,. J. Crystal Growth, (The Netherlands) 119, 303-308 (1992). J. Mater. Sci. Letters (England) 10 (1991) 559-561. LEC Growth and Characterization of InP single crystals. Procs. International conference on defects in insulating solids, Parma, Italy,567-569. J. Phys. D: Appl. Phys., (England) 21, 1019-1021 ,(1988). Growth of hollow Bi2Se2S crystals from vapour. (Ed.P.Ramasamy, COSTED, ICSU, 1988) 124-166.
iodide transport, Mater. Chem. Phys., (Italy) 16(1987)181. J. Mater. Sci., (England) 22(1987)85-86. Mater. Chem. Phys., (Italy) 16(1987)197-201. Mater. Chem. Phys., (Italy) 16(1987)189-196. Indian Journal Of Physics, 61A (1987)455.25. Procs. III National Seminar On Crystal Growth, (1987) 101-107. Growth of arsenic tritelluride whiskers from vapour. J. Mater. Sci. Letters, (England) 5(1986)717. Il Nuovo Cimento, (Italy) 79(1986) 22-29. Growth of SbSI and SbS1-xOxI crystals.